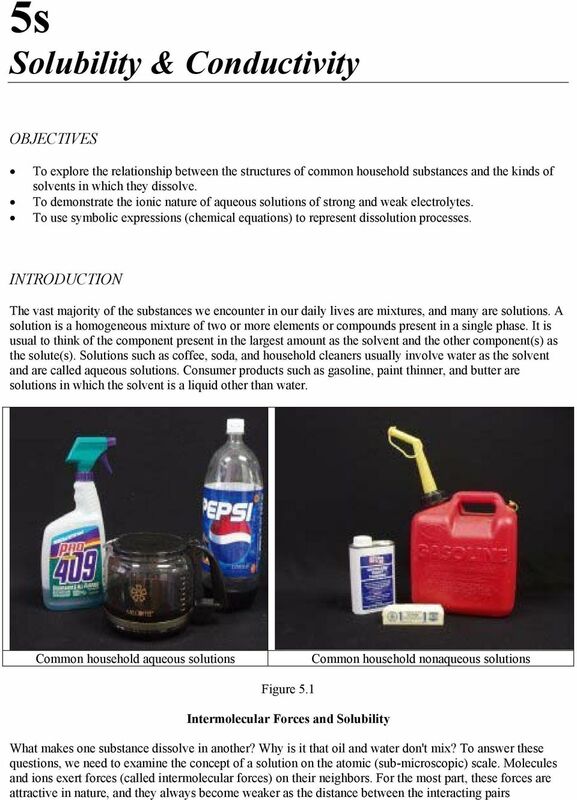 Download "5s Solubility & Conductivity"
2 increases. Because gas molecules are far apart (on average), intermolecular forces have little effect on their behavior, and solutions form rapidly when gases are mixed. The air we breather is a gaseous solution. Intermolecular forces play a significant role in the behavior of condensed phases (solids and liquids) since the molecules or ions are very close together in these phases. If a solute is to dissolve in a solvent, the intermolecular attractive forces within the pure solute and within the pure solvent must be overcome. 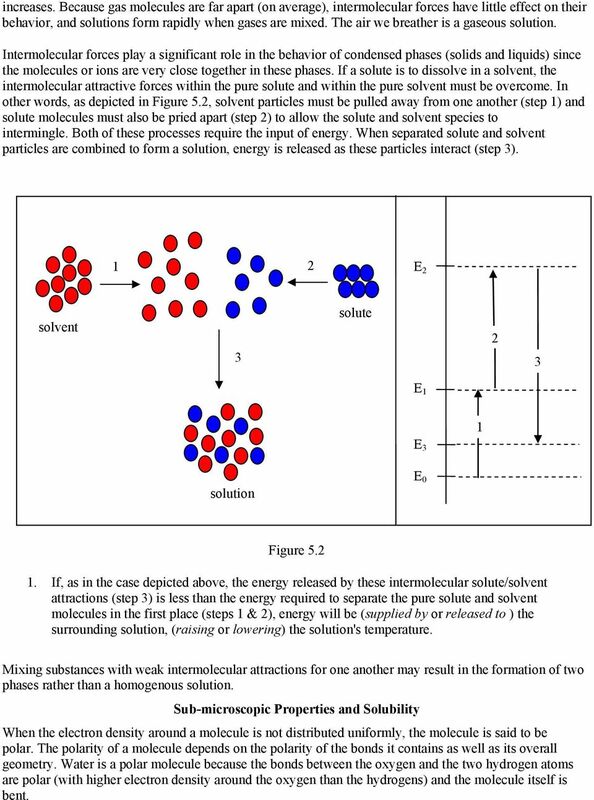 In other words, as depicted in Figure 5.2, solvent particles must be pulled away from one another (step 1) and solute molecules must also be pried apart (step 2) to allow the solute and solvent species to intermingle. Both of these processes require the input of energy. When separated solute and solvent particles are combined to form a solution, energy is released as these particles interact (step 3). 1 2 E 2 solvent 3 solute 2 3 E 1 E 3 1 solution E 0 Figure If, as in the case depicted above, the energy released by these intermolecular solute/solvent attractions (step 3) is less than the energy required to separate the pure solute and solvent molecules in the first place (steps 1 & 2), energy will be (supplied by or released to ) the surrounding solution, (raising or lowering) the solution's temperature. Mixing substances with weak intermolecular attractions for one another may result in the formation of two phases rather than a homogenous solution. Sub-microscopic Properties and Solubility When the electron density around a molecule is not distributed uniformly, the molecule is said to be polar. The polarity of a molecule depends on the polarity of the bonds it contains as well as its overall geometry. Water is a polar molecule because the bonds between the oxygen and the two hydrogen atoms are polar (with higher electron density around the oxygen than the hydrogens) and the molecule itself is bent. 4 Since ionic compounds are made up of ions, they interact well with polar solvents such as water, but show little affinity for nonpolar materials. Covalent compounds such as acetic acid (CH 3 CO 2 H) and hydrochloric acid (HCl) may also ionize, partially or extensively, upon dissolving. Solutions that contain electrolytes conduct an electric current, indicating the presence of mobile ions. You are probably more familiar with electrolytes in the context of minerals in cells to maintain water balance, and indeed the aqueous environment of cells is an excellent example of an electrolyte solution. A substance that dissociates completely in water (e.g. KCl or HCl) is said to be a strong electrolyte and will generally be a good electrical conductor whereas a substance that dissociates only to a small extent (e.g. CH 3 CO 2 H, which is only 1% to 5% dissociated in water) is called a weak electrolyte, and conducts to a much more limited extent. The double arrow that accompanies the acetic acid equation above is meant to indicate that most of the acetic acid in in the undissociated form. Covalent compounds that maintain their neutral molecular form when they dissolve in water are said to be non-electrolytes, because they do not conduct an electric current. 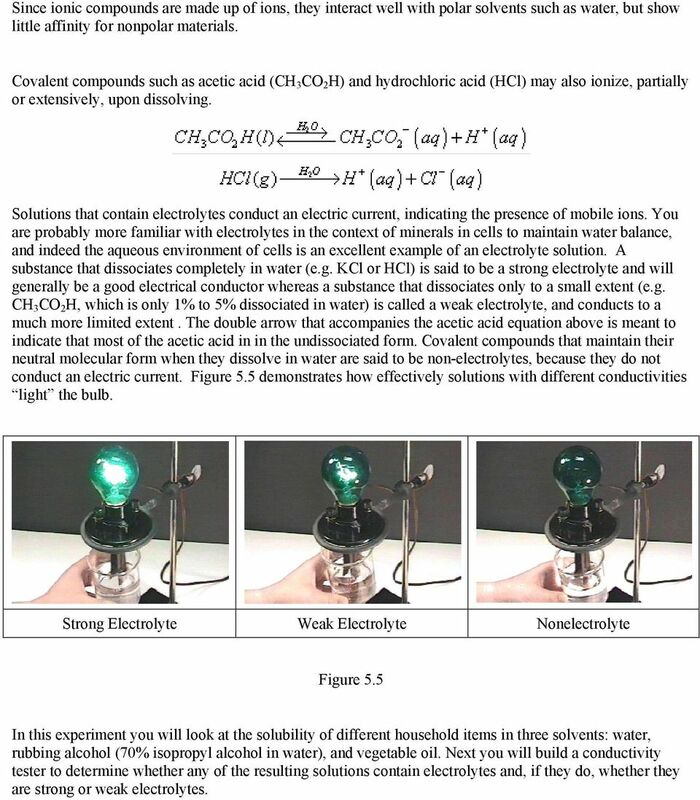 Figure 5.5 demonstrates how effectively solutions with different conductivities light the bulb. Strong Electrolyte Weak Electrolyte Nonelectrolyte Figure 5.5 In this experiment you will look at the solubility of different household items in three solvents: water, rubbing alcohol (70% isopropyl alcohol in water), and vegetable oil. Next you will build a conductivity tester to determine whether any of the resulting solutions contain electrolytes and, if they do, whether they are strong or weak electrolytes. 5 EXPERIMENTAL Solvents: o Distilled Water (from Grocery store) o Rubbing alcohol (70% isopropanol) o Vegetable oil (Canola, Corn, Peanut, etc.) Solutes: o Table salt o Baking Soda o Vinegar o Sugar 8 oz clear plastic cups Measuring cup Measuring spoons Materials for conductivity tester Conductivity Tester 1 - LED (Light Emitting Diode) 1 - Resistor(330 ohm, 1/4 watt) 1-9 volt Transistor Radio Battery 1 - Battery Clip to fit Battery) 1-8 inch piece Red wire 1-8 inch piece Black wire 1-4 inch piece Black wire tape Procedure 1. 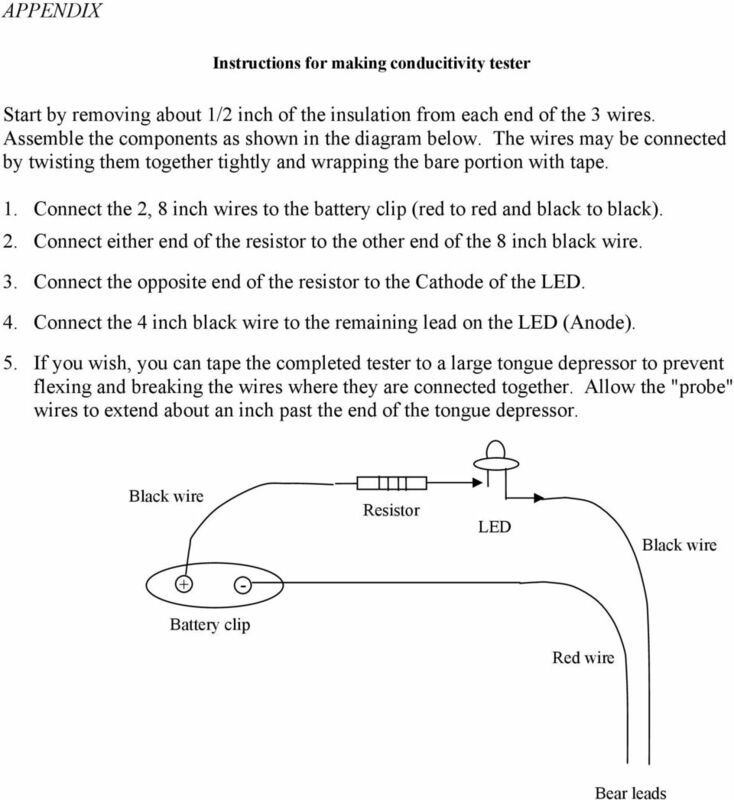 Construct the conductivity tester by following the instructions in the appendix. 2. 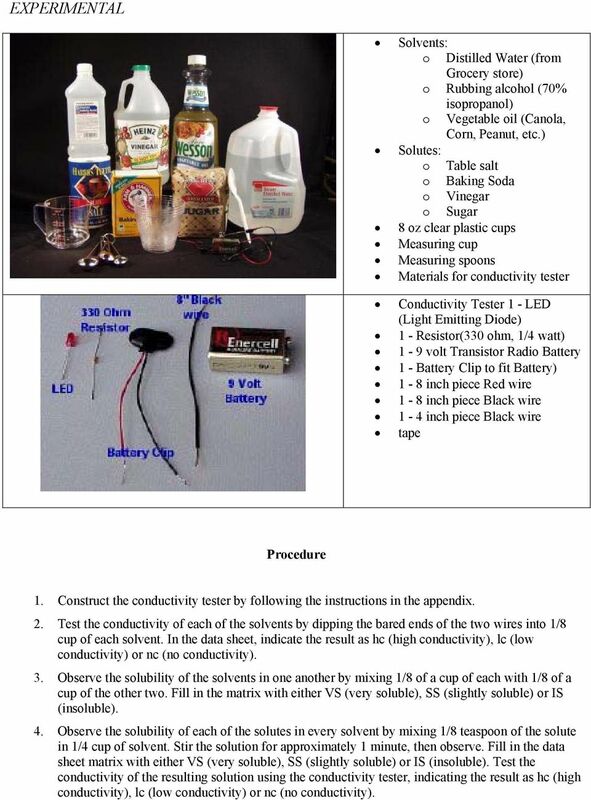 Test the conductivity of each of the solvents by dipping the bared ends of the two wires into 1/8 cup of each solvent. In the data sheet, indicate the result as hc (high conductivity), lc (low conductivity) or nc (no conductivity). 3. Observe the solubility of the solvents in one another by mixing 1/8 of a cup of each with 1/8 of a cup of the other two. Fill in the matrix with either VS (very soluble), SS (slightly soluble) or IS (insoluble). 4. Observe the solubility of each of the solutes in every solvent by mixing 1/8 teaspoon of the solute in 1/4 cup of solvent. Stir the solution for approximately 1 minute, then observe. Fill in the data sheet matrix with either VS (very soluble), SS (slightly soluble) or IS (insoluble). Test the conductivity of the resulting solution using the conductivity tester, indicating the result as hc (high conductivity), lc (low conductivity) or nc (no conductivity). 6 RESULTS & DISCUSSION Based on the data you collected, write a laboratory report in word that addresses the following questions: 1. Recalling that water is polar and based on your solubility results, indicate whether rubbing alcohol is polar or nonpolar. Explain. 2. Recalling that water is polar and based on your solubility results, indicate whether cooking oil is polar or nonpolar. Explain 3. 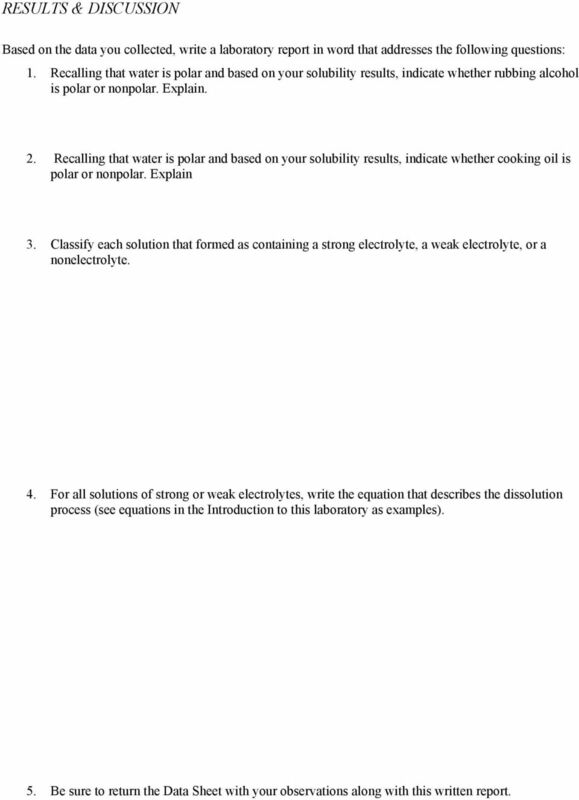 Classify each solution that formed as containing a strong electrolyte, a weak electrolyte, or a nonelectrolyte. 4. For all solutions of strong or weak electrolytes, write the equation that describes the dissolution process (see equations in the Introduction to this laboratory as examples). 5. Be sure to return the Data Sheet with your observations along with this written report. Chemistry 51 Chapter 8 TYPES OF SOLUTIONS. A solution is a homogeneous mixture of two substances: a solute and a solvent. 111 Electrolytes and Ionic Theory - electrolytes: substances that dissolve in water to form charge-carrying solutions * Electrolytes form ions in solution - (ions that are mobile are able to carry charge!). Polarity and Properties Lab PURPOSE: To investigate polar and non-polar molecules and the affect of polarity on molecular properties. Name!!!! date Polarity and Properties Lab PURPOSE: To investigate polar and non-polar molecules and the affect of polarity on molecular properties. STATION 1: Oil and water do not mix. We all know that. 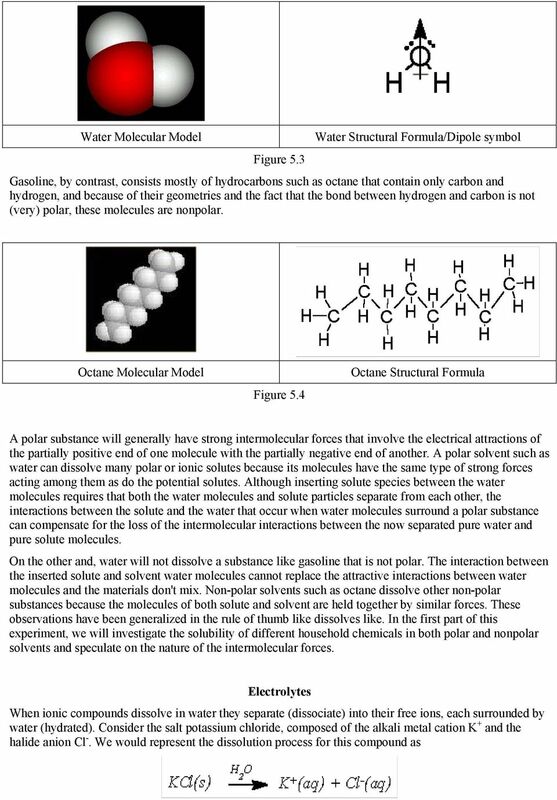 CHAPTER 10: INTERMOLECULAR FORCES: THE UNIQUENESS OF WATER Problems: 10.2, 10.6,10.15-10.33, 10.35-10.40, 10.56-10.60, 10.101-10.
stoichiometry = the numerical relationships between chemical amounts in a reaction. The component present in larger proportion is known as solvent. Grade 9 Science Unit: Atoms and Elements Topic 4: Periodic Table & Compounds Topic Using the Periodic Table Metals, Non- Metals & Metalloids I can Explain and identify the periods of the Periodic Table. Name: 1. Which compound is most soluble in water? (A)silver acetate (C) silver nitrate (B) silver chloride (D)silver sulfate 2. 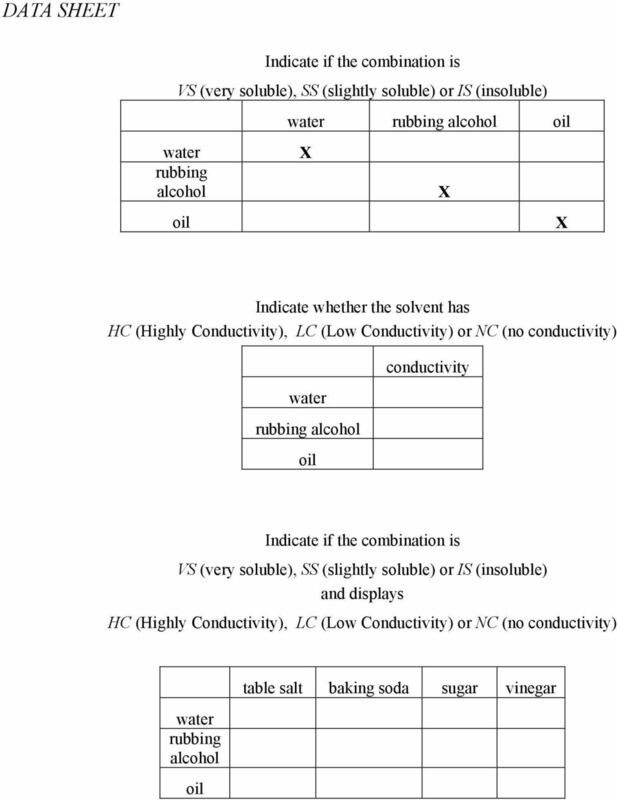 According to Reference Table F, which compound is most soluble in water? Part B 2. Allow a total of 15 credits for this part. The student must answer all questions in this part.